B Zimmerman, a member of the Long Island Model A Ford Club, is searching for a piece of a 1921 Crow-Elkhart to honor her great-grandparents. Can anyone help? Here is the request from B. "Howard, your weekly email featuring the various highlights of the Vanderbilt Cup Races and other events is a wonderful publication and something I look for to each Sunday! Thank You. I've lived on Long Island (from North Carolina for 41 years) and love cars! The Long Island Automotive Museum was like a candy store to me. Thanks for publishing that video! I have a question for you that no one has been able to help with. I'm looking for ANY piece - emblem, hood, fender, steering wheel, etc. of a 1921 Crow Elkhart sedan. They were built between 1909 and 1924 in Elkhart, Indiana and Mount Brydges, Ontario, Canada. My great- grandmother, yes great-grandmother, owned a Crow Elkhart, and like Driving Miss Daisy, my great uncle would drive she and her husband around! I am restoring their farmhouse, built by my great grandfather, and would like very much to put something "Crow Elkhart" in the old garage he build for his wife's car. I've searched eBay, googled the web, asked around - I can find ads from various dealers of the car (which I have) but no cars or car parts. I'd love to have a a car (dream on) or at least a 'piece of a car' (!) to put in the garage. Below is a picture of my great-grandmother's car with my great uncle by it as they crossed a river on a ferry. The Crow Elkhart automobile badge is shown below the picture. 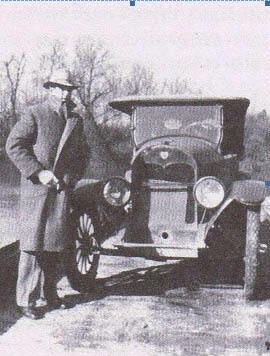 Dr. Crow, builder of the Crow Elkhart, used the heart-shaped emblem on the hood, radiator and/or rear windows to distinguish his car for others. Thanks for any direction you might offer in my search of a Crow Elkhart, and keep up the great work on your VanderbiltCupRaces.com website."